Sudoku is logic based number game. The aim of the game is to completely fill a 9×9 grid in such a way that there each row, column, and nine 3×3 subgrids are filled with digits 1 to 9. The only rule which has to be followed is that no same row, column, or nine 3×3 subgrids have the same digit twice. 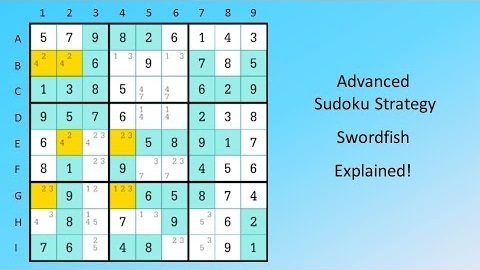 There are many strategies available to solve a 9×9 grid Sudoku puzzle. Amongst them, the most common and the best strategy is the Swordfish Strategy. Swordfish strategy is a more generalized form of the X-Wing strategy used to solve a 9×9 grid Sudoku. The X-Wing Strategy involves the use of two bases and two cover sets. In the Swordfish Strategy one uses three base and three cover sets. In simple words, instead of using a rectangle of four squares, the Swordfish strategy uses a grid of up to nine squares. The pattern formed is known as the Swordfish pattern. This strategy is used in eliminating candidates. Swordfish strategy is used by the solver when there are three rows available in such a way that each row contains either three or two of a given candidate. The matter of fact is that these numbers should be aligned on exactly three columns. Another way when the Swordfish strategy can be used is when are three columns in such a manner that each of the columns contains either three or two of the required candidates. The only necessity is that the numbers should be aligned in exactly three rows. The numbers then form a grid of nine squares. In order to apply the swordfish strategy, there should be at least six out of nine squares which should be unsolved. This six grid should contain the same candidates. In order to be a perfect Swordfish, either the columns of the swordfish grids should contain at least two or three of this candidate. Along with at least one of the columns should contain more than three of this candidate. Another way is when the row of the swordfish grids contains at least two or three of this candidate. Along with at least one column containing more than three of this candidates. Swordfish is when the rows contain at most three candidates, and the columns can contain more than three candidates. Whenever this case appears, the solver can eliminate any candidate on column except for the one that forms the whole Swordfish. When a Swordfish contains a column that has at most three candidates, the row can contain more than three candidates. Whenever this type of case appears the solver can easily eliminate any candidates present on the rows except for the ones that is forming the Swordfish. Swordfish in a Sudoku is not very easily found. The Swordfish pattern are found in the rarest of the cases. Who knows it might be a lucky day someday and you will find a Swordfish in your Sudoku.